Not sure of what to get the writer in your life? 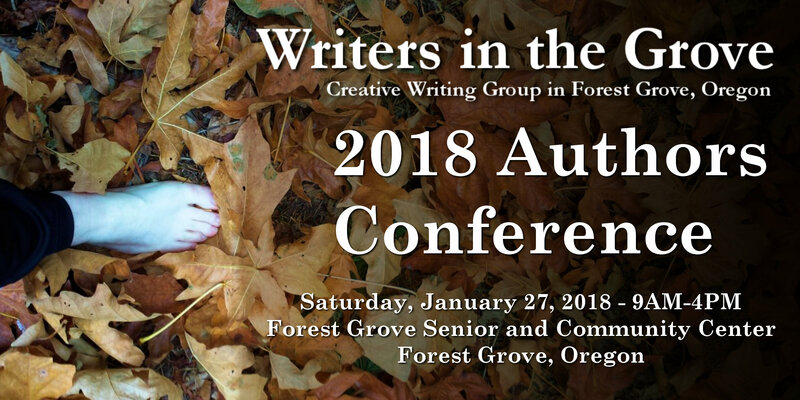 Consider one or more tickets to the 2018 Authors Conference January 27, 2018, 9am-4pm, in Forest Grove, presented by Writers in the Grove. So many of us travel to Portland and further for such a conference. Writers in the Grove is bringing the experts to you. The line up of speakers and topics represents the best in publishing expertise, professional fiction and technical writing, and professional writing and poetry teachers in Oregon. This is a fundraiser for the Forest Grove Senior and Community Center as well, our way of giving back to our community while offering access to the best writing and publishing advice for a low ticket price. The day-long conference includes lunch and snacks, as well as individual and small group extra sessions for one-on-one help with your writing and publishing, available during the event. If you are a published author or want to become one, or know one, this is the perfect conference for you. Register today for the 2018 Authors Conference in January before we run out of seats. The League of Exceptional Writers is a monthly workshop of authors and illustrators presenting writing tips, techniques, and publishing information to kids 8-18 years old. The goal is to help the young become passionate about literary, creative writing, and publishing, getting their stories out to the world. The next meeting is December 9, 2017, at the Cedar Hills Crossing Powells Bookstore in Beaverton, Oregon. Participants enjoy writing time with prompts and story ideas, and get help to learn how to publish their books. Washington County Writer’s Forum’s next meeting Hillsboro is July 6, 2017, with Adam Gallardo, author of young adult zombie fiction novels. The group meets at Insomnia Cafe in downtown Hillsboro from 7-9PM.